This recipe from Extending the Table: A World Community Cookbook is a delicious way to get more greens into your diet. Add as much hot chili as you’d like to increase the spice! rice or chapatis or something else starchy to eat it with. Or I guess you could eat it as a soup. I went with brown basmati rice. In a large skillet over medium heat, add 3 Tbsp oil and brown the onion. Add the garlic and ginger root. Stir in the spices (careful not to burn!). Stir in the lentils and coat with the spice mixture. Add water, potatoes (if using), spinach/chard; bring to a boil. Cover and simmer for about 20-25 minutes or until the lentils are soft. The Verdict: Sigh. I had forgotten how much I love Indian spices. When DH got home the first thing he said was “wow, that smells great!” And it went together in a snap. 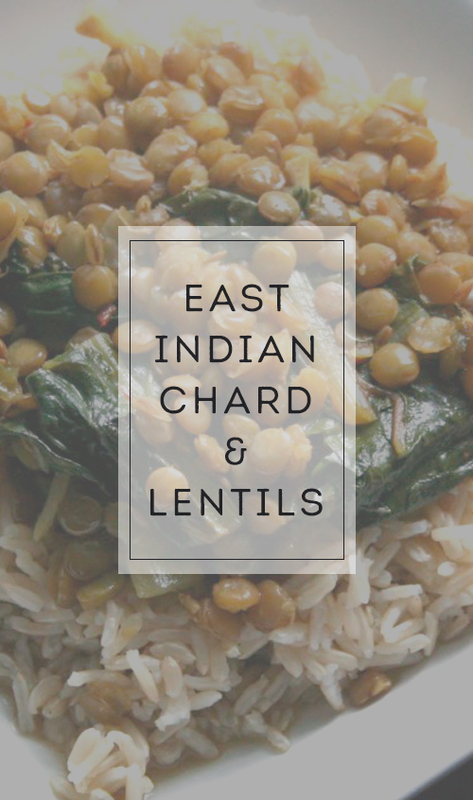 Why do I not cook with lentils more often? It was so good. DH added shredded cheese to his (at least it wasn’t chicken!) I think I prefer the chard to the spinach, although I’ve not had it with spinach. The chard was just so good. Next time I’ll go a bit lighter on the hot pepper flakes. This is making my mouth water … it looks fabulous and reasonably easy. One question … do you think one could use ground cumin instead of the seeds? Thanks, so much, for sharing! Aha. And that would explain yesterday’s trip to Mediterranean Island… Such an incredible place. It’s really limiting to think of it just as a “Mediterranean grocery” when the Karadshehs make such an amazing effort to stock goods from all over the world. Makes it a great place to search for almost any ethnic or unusual ingredient! This dish sounds wonderful, by the way; thanks, as always, for sharing. It IS amazing. I could spend hours in there looking around. I have never seen chard prepared this way. This dish looks great. I am definitely trying this soon. Thank you for sharing!! I just realized I sprouted 4 cups of lentils instead of 2. I was trying to think what I should make with them and this will be the perfect thing! thanks for the recipe! My husband saw this in my email and said, “Whose blog is that? That looks great! ” We love lentils. I’ll have to return the favor soon w/ some recipes that we have. :). OH I adore indian – It’s always a mouth party! Oooh I love me some Indian food. Thanks for sharing! I made this for dinner tonight and I will be making it again for sure! I soaked and sprouted my lentils, used kale instead of spinach, and sliced up some tomatoes in it. After tasting it we thought it needed something extra so we stirred in a can of coconut milk. It did the trick, made it creamy with a really nice flavor. We are big cilantro fans so I made sure to put it on the table so people could add it in to their personal dishes. The only other change we would make is only adding 1 tsp instead of 2 next time. Thanks for sharing! This sounds so warming and delicious – not to mention looks delicious also! Great looking recipe. Totally up my alley. Thanks.